Bummer Butter © for those bummer diaper ashes! Moms- try it on stretch marks too! "Cool find for hip babies and tots!" Featured in West Coast Family magazine! 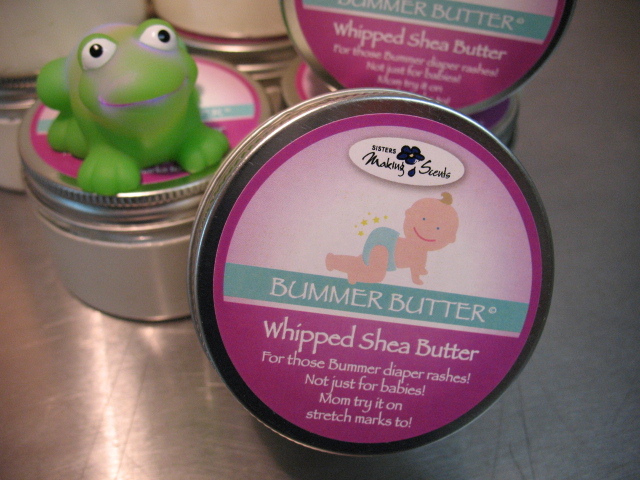 Our Bummer Butter © has been enjoyed by Moms and babies for nearly a decade and we are so proud to re-introduce this product with its shiny new label to our website once again. It's all natural Shea Butter, whipped to perfection with Sweet Almond oil using only pure essential oils of Sweet Orange & French Lavender for their healing properties. Healing and safe for your baby’s skin. Mom you will want to try it too! Many of our Mommys say it’s perfect for stretch marks; some of them even show up at the markets baring bellies for us to see! Simple to use, apply sparingly to babies clean bottoms. It sets up a healing barrier that protects babies bottom while healing their skin. A little goes a long ways so it's perfect for those moms that choose cloth diapers. There are no phthalates, BHA, parabens, or arificial fragrance or color added to our baby Natural products. I purchased one of your Bummer Butters at the Coquitlam Express games back when you guys were at their Farmers Market night! I only purchased one of your containers and boy was that a mistake.... Your bummer butter has been a life changer for my daughters booty!! We have fallen in love with not only the results but the smell! I have told many mommy friends about your product and passed along your company name with high reviews!